I find it amazing that through out my years of schooling and even graduate studies in Biomedical engineering, that there were subjects of value that were not even mentioned. It would seem that if there was some technology or method that had the potential of saving many lives, it would be at least mentioned or discussed. Yet, not once was this topic ever mentioned. It was almost as if they were intentionally trying to hide this information to keep people from finding out. When I first read about this topic in a Ham Radio magazine, I was completely skeptical. If nothing else, if such technology could save lives and reduce the toll of disease and illness, then why had I not heard about it. What was going on here? Even worse, when I found that this technology was first successfully tested was in the 1750's it brought even more questions and a realization that the topic was truly being suppressed. The book offered below has a section on the History of this technology that shows the extensive effort that has gone into suppressing this information. You can also find in the menu above a sitemap that lists closse to 90 pages of discussion on this and related information. Even more amazing is the amount of false information that has been placed on the internet as well as the Orwellian efforts to hide the zapper from the public as well as to defame it. There are sites out there, some like the Quack watchers and others that call themselve skeptics. They have an agenda and many are actually paid to defame Hulda Clark and the zapper as well. One of the false claims that they present is that Dr. Clark claimed that the zapper was a cure for cancer. Nothing could be further from the truth. The zapper is only a tool that Dr. Clark stated was used to kill infectious microbes such as bacteria, protozoa, and fungi. That is what the zapper does. If it is used to kill germs, then why is it in a book for fighting cancer? The answer is simple, people who are fighting cancer and other illness as well such as autoimmune disorders, usually have failing immune systems and for that reason are susceptible to infection which can even result in death. Immune system failure is a serious problem and there are many advertizements for drugs to help fight infections when fighting cancer, especially after taking chemo-therapy or going through radiation. Many of these drugs present serious side effects, even additional cancer and death. There has only been one published study on the zapper and there were not any significant reported issues and NO major side effects from use. This site sold zappers from 2001 to 2006 and during that period became a leader in the market, selling as many a 400 zappers a month. In Feb. 2006, the company was raided by the FDA and although no charges we ever brought, a warning letter was sent in Aug. 2006. The letter is still available on the internet. A new company was formed as a corporation and zapper sales were moved to a different site and there are no claims made on that site for treating or curing any disease, illness, or condition of the Human body. who do not use them. than those not using them. This new updated book contains 115 pages of printed information (including index and TOC ), much that is not available anywhere else, not even in Dr. Clark's books. This booklet is not included with any zapper shipment for legal reasons. Amazon has an app for laptops, desktops, notebooks, pads, and phones. 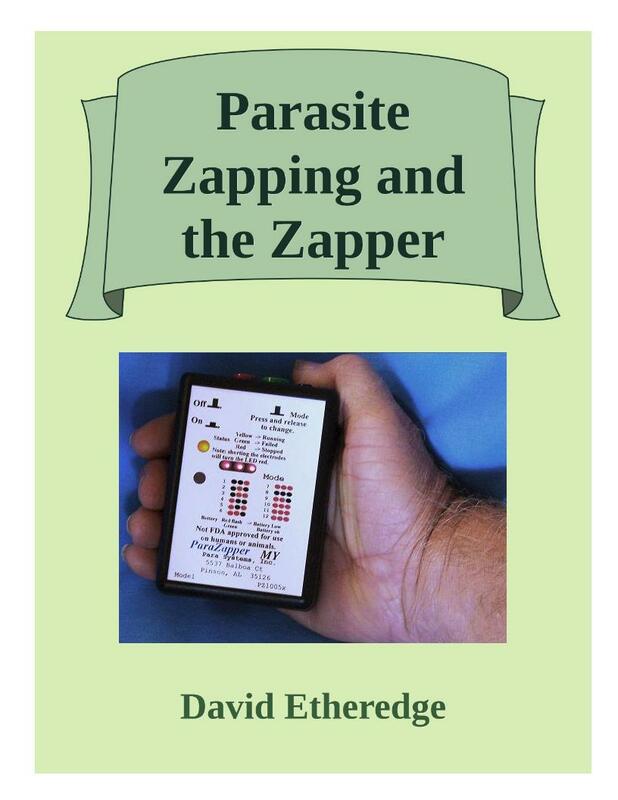 or search any other book seller by typing in 'Parasite Zapping and the Zapper by David Etheredge'. They will let you know if it is available. 1 Booklet for $17.95 US. A 115 page (including index and TOC ) Guide to zapping provides information on how to zap for best results. This manual, originally written for ParaZapper products provides theory of operation, good information on how to zap, accessories to use, things not to do, how to get the best results, and notes on other alternative methods. It also includes some zapper schematics, information on fifteen different models of zappers, and where to get info on how to build your own. The methods and information discussed in this book are valid for almost any zapper that you might use and the book contains many discussions that are not considered in Dr. Clark's books or anywhere else. (115 pages including index, TOC, illustrations). Dr. Clark's books contain only 4 or 5 pages of information on the zapper and zapping and do not cover many of the topics and advances listed in this book. Included in the latest version are brief introductions to 28 alternative therapies that can be used along with zapping. Also included are discussions of over a dozen various metals that may influence the outcome of zapping or be influenced by zapping. There is also a discussion of die-off and Herxheimer reactions as well as various problems that may occur when zapping. There are also basic discussions of over 30 health related issues and problems including the use of the zapper in association with these problems. Also included is a brief history of the use of electricity for treating disease and illness, going back to the 1700's. The Zapper is one of many alternative health products for alternative medicine applications. It is designed to electronically kill parasites. The information, suggestions and ideas presented in the book are for information only and should not be interpreted as medical advice, meant for diagnosing illness, or for prescriptive purposes. Readers are encouraged to consult their health care provider before beginning any treatment program. The information in this document is not to be used to replace the services or instructions of a physician or qualified health care practitioner. Any testimonials or survey results presented on any of these pages are not presented as scientific proof of any cure but only as representation of relief that may possibly be obtained from the use of ParaZapper ™ products. FDA accepted tests have not been preformed because we have not found any qualified medical doctor who has indicated that they were willing to perform the required tests.